It can be tempting to chalk up all your entertainment expenses as business expenditures but you must resist the temptation or face the music from the IRS. Small business expenses do have rules and if you break them, you could find yourself in tax trouble. Entertainment expenses including those for meals out are sometimes the most confusing of all business expenses when it comes to appropriate deductions. You have to make sure the expense is justifiable. It is not as straight-forward as it seems and it is important to keep deductions in line with the rules. Here are a few tips to help you make the right determination about deducting small business entertainment expenses. Any entertainment expense you are considering for use as a deduction must be directly relevant to the operation of your business. You can take a potential client to lunch but there must be serious discussion about business relationships in order to qualify as a deductible expense. You can’t simply have lunch with a friend and talk about work problems. 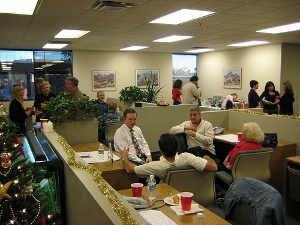 If you host a gathering at work or in your residence, you must engage in proper business dealings throughout the get-together. Presentations or product demonstrations should be an essential component of your business-expensed party. If you consistently turn in receipts for bar meeting locales and high bar tabs, the IRS may consider the party too inebriated to make effective business dealings. In order to provide proof that you are indeed talking business when meeting at locations outside the office, keep in mind that the IRS will be looking for logic in your choices. Attempting to convince the federal government that your high cost weekly office celebrations are necessary for business operations may be a pointless cause. It is best to keep business bashes within a budgetary limitation. If your company is not showing much profits during a year but your expenses are off the charts for entertainment, it is not reasonable to expect the parties to be tax-deductible. Your small business can deduct 100% of the expenses for a party or other form of entertainment if the people attending are from the general public as a way to showcase your product or services or if you are celebrating only with employees and their respective spouses. If you host a party for clients or for any subcontractors that work with you, you can only take a 50% deduction for the cost of the gathering. It is wise to consult with your CPA about each gathering to get the proper amount of acceptable deductions. Be sure to keep track of all parties, who attended, and what business was accomplished. Otherwise everything will just blend together by the start of another year and you may not be able to justify any of the entertainment expenses. Staying organized with your bookkeeping throughout the year is the only way to ensure you’ll know what you are talking about come tax time. Mark all receipts with the date and purpose of the meeting or entertainment expense. Include notes to yourself about who attended and what was accomplished to help you keep your accountant in the know. Keep all receipts in one convenient place so it is easily retrievable when you need it. Busy people tend to toss receipts in their pants pocket, purse, desk drawer, or elsewhere so when it comes time to do tax deductions, they have a lot of difficulties recreating history and are unable to provide proof of the actual expense. Thanks for the tips, I have never been audited, but I do try to follow the general rules you have stated.